Very good and unique experience. Well organised. The line may seem a mile long if you’re not there early but it moves pretty fast. We possibly had 800+ people in front of us and it only took 20 mins to get to the front. You do need to wear your poncho and water shoes because you WILL get soaked if not. Overall it was well worth the money! Breath taking...and refreshing tour!!! The wait for the tour was surprisingly short. Plenty of memories and excitement!! It was easy to book. Boat ride was fun! Had two kids with me and they had a blast. Would totally don't again! It always amazes me seeing Niagara falls. Now after 10years together with my teenage kids it's more fun and memorable. Family fun! A must do. You will get wet! Loved Niagara Falls and this boat tour has the process down with virtually no waiting in long lines...so cool to be in the center of the falls! You can't get any closer to the Falls than this! It was fabulous and the tour operator was fantastic! Excelente experiencia. Evitamos la cola y nos proporcionaron el dispositivo para escuchar lo relacionado con el tema de las cataratas. This ride was excellent as long as you time it just right. The lines get pretty outrageous, we initially requested afternoon tickets however when we saw the lines we changed it for the first possible time slot the next morning. Totally worth waking up early we got straight on the boat and got great spots. The falls are very majestic the closer you get to them! Go early and avoid the line though!!! Did this tour as we were staying on the Canadian side of the border, not the American. Did exactly the same thing as the famed Maid in the Mist. Took us right up to the falls and it was spectacular! Word of warning, you get a poncho, which is great for your top half, but be prepared to have you legs soaked! All is good, it's only water, a fact I had to keep explaining to my wife. A fantastic tour - line moved very quickly and we had very little wait time. Well operated. Boats not over crowded and all places are good to view, as the boat heads in then turna around, so both sides enjoys the view. Prepare to get wet - very wet!! Great fun. We purchased are tickets online, last minute and the process was flawless. That allowed us to bypass the extremely long ticket line once we arrived onsite. Unfortunately, the address provided to us on our ticket vouchers after purchasing our tickets online was not found in our GPS and we had a lot of trouble getting in contact with a representative from the tour company when we got lost on our way there from Toronto. Eventually we made to the destination via directions from locals ONE HOUR before the last tour and surprisingly found parking. We made it through check in and onboarding in minutes due to the onsite organization and the well trained staff. The experience overall was amazing, for we expected to get close to the Canadian falls not go directly through the Canadian falls, which was AWESOME. Very affordable and accommodating, highly recommend. Splendid, Splendid, and Splendid. Highly recommend this activity if you are visiting Niagara falls. It gives you a true idea of just how alive the falls really are when you get close up. Don't miss out on the opportunity. 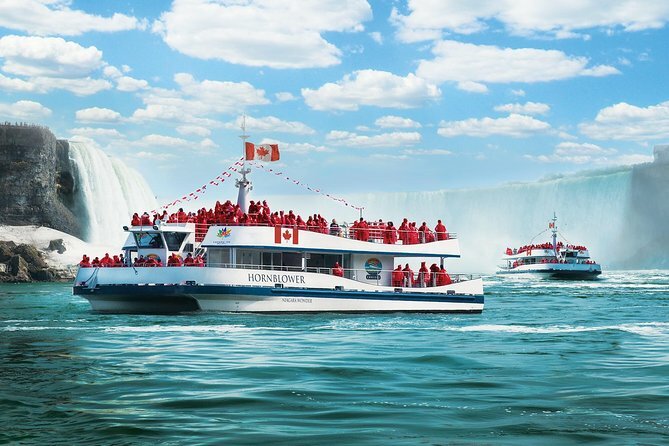 This experience was exactly what you expect from a Niagara boat trip. You get wet, and are amazed by the falls. We went early in the morning so there was no waiting - the queue moved constantly and efficiently. It was a great intro to everything that the Niagara Park area had to offer. We saw the zipline ride from the boat and went on that also - awesome! The whole of the Niagara Park area is really lovely.